Headaches can range from mild to debilitating and can be caused by a number of problems, one of which includes cervical spine issues. Faulty sustained postures (upper cervical extension and lower cervical/upper thoracic flexion posture) in the cervicothoracic spine can cause mechanical headaches even if the person is not experiencing neck pain. This poor postural pattern easily occurs during long commutes and while sitting at the keyboard. The McKenzie Method can effectively treat mechanical headaches with a variety of exercises. This method is a systematic mechanical approach, first described by a New Zealand-based physiotherapist named Robin McKenzie. We start with a comprehensive assessment of the patient’s pain and how it is affected by movement and posture. Intervention relies on repeated movements and symptom response to determine preferential direction of movement. Within the first physical therapy session utilizing the McKenzie Method, a patient’s pain can be completely abolished within several minutes. The patient is then instructed on how he/she can achieve those same results independently and maintain a reduction in symptoms through exercise and posture correction. Therefore, the patient needs fewer physical therapy visits making treatment more affordable and manageable. Overall, the McKenzie Method of physical therapy empowers individuals to take control of their headache symptoms through simple, specific exercises that can be applied easily at work or at home. Soft tissues in the cervical and suboccipital regions can be involved in headaches. Most commonly, dysfunction in the upper trapezius, levator scapula, SCM, and suboccipitals muscles are involved. Two of the most effective options for treating soft tissue dysfunction are Augmented Soft Tissue Mobilization and Dry Needling. Augmented Soft Tissue Mobilization aka ASTYM (A-stim) treatment is a rehabilitation program that stimulates the regenerative healing process of the body. This approach is a non-invasive therapy that works fast and consistently. The ASTYM system rejuvenates muscles, tendons and ligaments. It gets rid of scar tissue problems from old injuries in a fashion previously unimaginable. We have the scientific background, data and experience that prove it. Dry Needling is a valuable manual therapy technique for the evaluation and treatment of neuromyofascial pain and dysfunction present in the acute and chronic population. 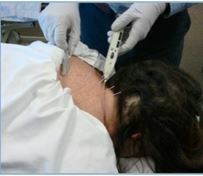 Dry Needling involves multiple advantages of a filament needle into the muscle in the region of a “Trigger Point”. The aim of Dry Needling is to achieve a local twitch response to release muscle tension and pain. Dry Needling is an effective treatment for chronic pain of neuropathic origin with very few side effects. This technique is unequaled in finding and eliminating neuromuscular dysfunction that leads to pain and functional deficits. All methods work individually, or in combination to resolve severe and debilitating headaches. “I have had migraine headaches since I was a child. I have been treated using medications, orthodontics, mouth guards, chiropractic, psychiatry and years of general massage therapy and deep tissue work directed on the neck and back.